It's the Biggest Event of the Summer, SummerSlam, LIVE from the STAPLES Center in Los Angeles - and this year is shaping up to be one of the greatest events in recent memory. We've got a "Ring of Fire", The Best vs. The Beast, an unpredictable WWE Championship match and much, much more. Biggest Event of the Summer? You bet. In this article, each match on the card is previewed, before I deliver my own predictions. This also includes social media, videos and much more content to get you hyped for what will be an incredible night at WWE SummerSlam. We're kicking off things with a bang at SummerSlam, as Dean Ambrose will defend his United States Championship against Rob Van Dam. Rob Van Dam - who returned at the last pay-per-view, Money in the Bank - earned this opportunity when he prevailed from a compelling Battle Royal to determine the #1 contender on RAW. This is going to be an interesting match for sure. While booking it on the kickoff show is questionable, it will be a good match regardless. Rob Van Dam would have been expected by most fans to be in a bigger match up the card but with the Battle Royal on RAW it feels like prestige has been restored. I think Dean Ambrose will pick up the victory. WATCH: The SummerSlam Kickoff Show streams LIVE an hour before the event at midnight (UK time) or 7ET/4PT in the United States. Head to TheSportMatrix.com at the time to watch the kick-off show LIVE! Will Dean Ambrose be able to outwit the unorthodox style of Rob Van Dam? Or will a Five Star Frogsplash seal the deal for a New United States Champion? It was a friendship in turmoil at WWE Money in the Bank, when Damien Sandow double-crossed his friend Cody Rhodes to steal the Money in the Bank briefcase. This Sunday, two of WWE's most promising stars take to Los Angeles to settle a rivalry that has span out of control. Ever since Damien Sandow's renowned betrayal of Cody Rhodes, revenge has been sweet. From the briefcase landing in the Gulf of Mexico, to numerous attacks and brawls, this match at SummerSlam has all the hype going for it. It's great to see Cody Rhodes and Damien Sandow getting a lot of spotlight going into the match, both on RAW and SmackDown, they have been a buzz topic from the shows. This match is quite hard to predict, you have to bring it down to who needs the win more. Does Damien Sandow need to win, because he has looked very weak in the weeks building up to this match? Or does Rhodes need the win more to solidify that he is back for business? I think that Damien Sandow will win, but I am still unsure. From the humble beginnings of their friendship with the intellectual Team Rhodes Scholars to a ferocious rivalry that has lead to this match at SummerSlam, Cody Rhodes and Damien Sandow will, without a doubt, put on an excellent match at SummerSlam. Will the Intellectual Saviour Damien Sandow leave with the Bragging Rights? Or will it be bittersweet revenge for Cody Rhodes? Two personal rivalries become intertwined at SummerSlam as a compelling Mixed Tag Team match is on the cards, when, Dolph Ziggler and Kaitlyn team up to take on the alliance of Big E Langston and AJ Lee. The ring will consist of four combustible elements come Sunday, including best friends turned nemesis, a couple turned spiteful and allies turned against each other. At the centre is the feud between Kaitlyn and AJ Lee, of who battled over the Diva's Championship dating from WWE Payback. Kaitlyn was betrayed by her best friend and she seemed to decline in despair following the losses and broke down. AJ Lee came crashing down from her glory when Dolph Ziggler broke up with her, thus triggering a mental breakdown on the part of AJ Lee. To further complicate the matter, things got heated between Big E Langston and Dolph Ziggler, as the two battled twice with unjustified finishes. Rather than settling these feuds separately, SummerSlam host The Miz has upped the ante and he booked the Mixed Tag Team match for SummerSlam. This match is a great booking utilizing two rivalries into one personal match. If we did see the separate bouts of AJ Lee vs. Kaitlyn and Big E Langston vs. Dolph Ziggler, many would not anticipate it as these matches have been seen before. Obviously, this tag team match makes things much more interesting. This is another match that is hard to predict, because a win or loss but I think that the feud may need to end although I don't think it will. And with Big E and AJ looking so weak at the moment I think they will pick up the victory. Will Dolph Ziggler and Kaitlyn be Showing Off after their win? Or will AJ Lee skip off triumphant when she and Big E pick up an important win? The Wyatt Family have made a quick and lasting impact on the WWE from the day since their arrival. In particular, The Big Red Monster Kane has been subject to numerous attacks. Kane and Bray Wyatt will do battle one-on-one in a ring surrounded by fire with epic potential. Kane was sidelined from the Money in the Bank All-Stars match after a savage attack from the Wyatt Family. However, a few weeks later Kane would return only to be attacked again. Eventually, Kane began to get in the mind of the Wyatts, but any time he attempted to take them out, the numbers game got to him. The significant epitome of the rivalry came on the final SmackDown before SummerSlam, when Bray Wyatt and Kane engaged in a brawl but the other members of the Wyatt Family continued to attack Kane before Bray Wyatt got the better of him and sent a message to Kane ahead of SummerSlam. But on Sunday, there will be no numbers game, because the Ring of Fire will keep people out, leaving it one-on-one between Bray Wyatt and Kane. We're in for one exciting contest come SummerSlam. It's been a long time since we have had the ring surrounded in fire. Although it won't be the traditional stipulation of the inferno match, it is going to be a great sight. Bray Wyatt is a great competitor - many know this from his time in the Nexus as Husky Harris - and Kane is a veteran who will put him over at SummerSlam. This match is just really intriguing and exciting, I have a feeling that it might steal the show. How will Bray Wyatt fare within Kane's battle ground? Will the Big Red Monster get redemption on the Wyatt Family? Or will Kane's loss lead him to Follow the Buzzards? Christian finally gets "One More Match" as he challenges Alberto Del Rio for the World Heavyweight Championship at SummerSlam. Captain Charisma Christian earned the shot at the Gold when he defeated Rob Van Dam and Randy Orton to be crowned #1 contender after an incredible battle. Christian was attacked after the win, and Del Rio has used the vicious attacks prior to the Championship match. An odd booking by WWE Creative meant that Alberto Del Rio fought Christian in a non-title match on SmackDown and Christian has been riding a high wave of momentum, most recently on SmackDown when Alberto Del Rio attacked him, but he managed to hit the Kill-Switch. One of the most stupid booking ever was when Alberto Del Rio battled Christian on SmackDown. What was the point? Unless the match at SummerSlam is going to be quite short, then the problem may be resolved. Christian goes in with the momentum and I have a feeling he is going to win, Del Rio's reign is just becoming stale. I predict Christian will win. Will Christian capture the Gold in his One More Match? Or will the Mexican Aristocarat fight off his biggest challenge to date? Daniel Bryan has been on fire in the best months of his career recently. 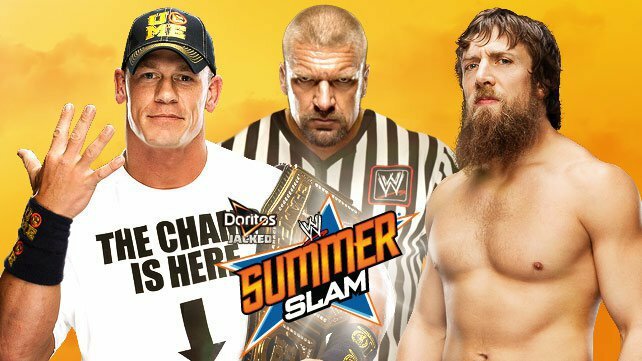 At SummerSlam, Daniel Bryan looks to take the momentum to John Cena and win the WWE Championship. The WWE Champion John Cena handpicked his opponent, Daniel Bryan when he was offered to by RAW General Manager, Brad Maddox. However, the Chairman of the Board, Vince McMahon, has had an issue with this, because he believes Daniel Bryan is not right person to be WWE Champion. Daniel Bryan proved his value as WWE Champion when he defeated Antonio Cesaro, Jack Swagger and Ryback in a Gauntlet match. He further proved his wrestling credibility when he defeated his former friend, Kane. Even a corporate makeover was not enough to satisfy Vince McMahon. In the final RAW before SummerSlam, things epitomized. It looked like Vince McMahon was proceeding to declare Brad Maddox as the referee for the bout, but Triple H was having none of it and declared himself as the referee. That's one problem sorted, isn't it? Randy Orton captured the Money in the Bank briefcase to secure a guaranteed shot at the WWE Champion, and he has quietly been making himself heard and declared that he will cash in on the WWE Champion - whoever it may be. This match is hard to predict. But I feel that the McMahon family feud will ruin it. I want to see John Cena and Daniel Bryan one-on-one to see who's better, not just to set up for the next chapter of the WWE. I really hope that Cena puts Bryan over, and he submits to Bryan. This match should still be a great contest but the outcome may be taken by the spotlight-hogging McMahons. The emerging news about John Cena's injury also sways in Bryan's favour, that Cena will drop the title to him. My prediction is that Vince McMahon attempts a screwjob against Bryan, and Cena argues with Triple H allowing Bryan to finish him and win. Randy won't cash in, but maybe he will the night after on RAW. Will John Cena be able to extinguish the burning flame in Daniel Bryan? Or will we crown a NEW WWE Champion at SummerSlam? In a showdown of epic proportions, two men who owe their careers to Paul Heyman do battle at SummerSlam. It's CM Punk vs. Brock Lesnar, it's The Best vs. The Beast. It all started on June 17, 2013 - when Brock Lesnar delivered an F5 to CM Punk. After that, Paul Heyman denied that he ordered Lesnar to F5 Punk, but later on that appeared to be true. Paul Heyman is the catalyst behind this, as he betrayed CM Punk at Money in the Bank. Now they look to settle their differences. CM Punk has proved he is the Best in the World, with a record 434-day title reign as WWE Champion. Meanwhile, Brock Lesnar has showed his brutality to be titled The Beast. When they face off at SummerSlam, it has the potential to be an incredible match. In the few brawls that ensued ahead of the SummerSlam match, Brock Lesnar prevailed in them and victimized Punk. However, in the final RAW before SummerSlam, CM Punk slayed the beast... momentarily, using a camera and a chair to leave Brock Lesnar beaten up - a huge message ahead of SummerSlam. This match is going to be incredible. Two of WWE's best finally do battle, it really is a dream match. Brock Lesnar needs to look strong and win, but so does CM Punk. This match is a hard one to predict, but in the likelihood of a possible rematch at WrestleMania, I would not mind that. Paul Heyman's build up to this match has been great, and I believe CM Punk will get his hands on Heyman, and CM Punk will win but they may have a rematch. The Best. The Beast. One ring. SummerSlam. There is an incredible line-up for SummerSlam with the potential to be one of the greatest events in recent memory. The Best vs. The Beast, a delicate balance in the WWE Championship, possible triumph as World Champion, Ring of Fire and much more. SummerSlam is just hours away, things are REALLY heating up. Head to TheSportMatrix.com at 7pm ET/ midnight BST for the LIVE SummerSlam pre-show.